This new album from the Gabrieli Consort follows the successful design of their previous release Road to Paradise which took listeners on a musical pilgrimage from Medieval to present times. Similarly, A Spotless Rose draws on works by European composers from Josquin to Adès to explore music which honours the Virgin Mary, the most venerated of all Catholic saints and the inspiration for much devotional music throughout the ages. The programme is organized around key events in Mary's life and is performed a cappella in the beautifully resonant Lady Chapel of Ely Cathedral. It opens with a slow and sensuous performance of Tavener's A hymn to the Mother of God which uses the acoustic space to allow the emerging and merging harmonies to envelope the listener. The setting of 'Ave Maria, virgo serena' by Josquin which follows is a remarkable piece and in this performance Paul McCreesh avoids any sense of hurry to create a surface stillness which is most beguiling. 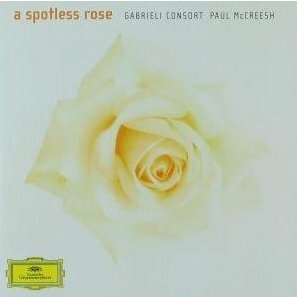 In fact, this stillness which is conjured up so sensitively in the first two tracks pervades all of the early works on this disc and also carries over into 'A Spotless Rose' (Howells) and 'The Fayrfax Carol' (Adès), creating a meditative framework which underpins this whole programme and demonstrates the incredibly high standard of choral discipline of the Gabrieli Consort. McCreesh's singers have beautiful voices and show an innate sensibility for the linear as well as the harmonic qualities of much of this music. In terms of expression I feel that they would like to give more than they are allowed here, especially in the Palestrina Stabat Mater where really tempting glimpses of heightened emotions begin to shine through the inevitable Oxbridge filter. In some respects this album, like its predecessor, also represents a journey; a meditative journey, since a subtle but persuasive crescendo works its way through this whole programme gaining in intensity and passion until the final section when bigger voices begin to emerge - most notably in the works by Bax, MacMillan and Górecki. However, in an otherwise beautifully crafted trajectory, one can't but help feeling that the meditative atmosphere is momentarily shattered by Giles Swayne's Magnificat I. Despite the sheer beauty of the soprano's ending, this sudden bawdy outburst makes the programme feel a bit like a choral-sampler when, in so many other respects, it is much more than that. In other contexts I quite like this piece but here it feels gimmicky in comparison to the textures of the works that surround it. These are, of course, personal reactions to the album and we all bring our own cultural, intellectual and spiritual baggage with us when we listen to music, especially devotional music which appeals directly to the fundamental beliefs of a faith. However, I feel sure that listeners will be united in admiration for the transcendental beauty of the music-making on offer. The Gabrieli Consort and Paul McCreesh have made another fine disc and they remain on top of their game as some of the finest interpreters of choral music.